This entry comes from the Garden Island Newspaper, 23 May 1912. 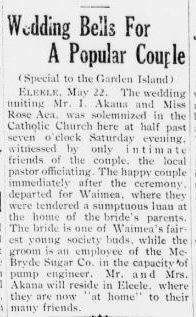 I’ve often wondered how weddings might have been celebrated in the early 1900s in Hawaii. I found this article in the newspaper that describes the wedding of Mr. I. Akana to Miss Rose Aea. The couple was married in the Catholic Church in Eleele, I believe. From there, the couple left for Waimea. A luau was being held in their honor at the Bride’s parents’ house. The couple was well know in the area, at least Rose was. Rose was part of Hawaiian society. Her husband was a pump engineer at McBryde Sugar Co. The couple settled in Waimea after the wedding.